Spring Break was lovely, but I'm tired and I'm beginning to think the fourth grade sounds like a vacation compared to entertaining my two all week. ;o) At least the fourth graders don't mess up my house or expect me to prepare them meals! On the plus side, we just bought fresh fruit and we had a nice leftover pasta salad to form the base of the kiddos' lunches. We did matching lunches too, because it requires less brain cells on my part. 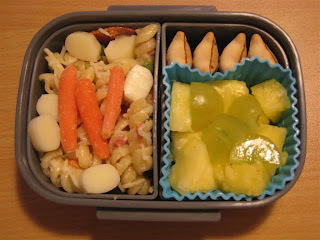 Both kids had the leftover pasta salad which I spruced up with some cheese cubes, diced pepperonis and a few carrot sticks, some fresh pineapples & grapes, a few koala cookies, and a side dish of vanilla yogurt with blueberries (not pictured, you all know what yogurt looks like I'm sure!). Two lunches, two kids, minimal thinking on my part, all is good in the world. 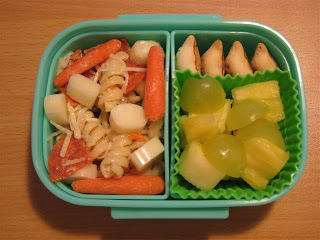 Shannon, I really enjoy reading your blog and looking at the kids lunches.I just got into Bento recently and have been making them for my hubby. I love to look at what other people are doing to get ideas and inspiration! I'm practicing on my husband so that when my 2 yr old is ready I can make lovely lunches for her like you do for your little ones! Thanks!!!! First off, THANK YOU for all the inspiration as I'm beginning to get a bit more 'ambitious' with my daughter's lunches! I was also intrigued to learn that your 6yo daughter attends a University Model School, as that is something we are in the process of considering for our 6yo next year!